SPP Hyderabad Consultant Recruitment 2019: The Security Printing Press Hyderabad officials has released a recruitment notification for 54 Consultant posts. Eligible and interested candidates should apply for SPP Hyderabad Consultant Jobs 2019 before the end date. For this SPP Hyderabad Recruitment 2019, the application process started on 2nd April 2019 and the end date 8th April 2019. The SPP officials will conduct the Interview on 10th April 2019. Here on this page, we had provided all important information about the SPP Hyderabad Consultant Vacancy details. So all the applicants should go through this entire article and capture all needful stuff. Candidates must apply for SPP Hyderabad Consultant Job Openings through offline before 8th April 2019. 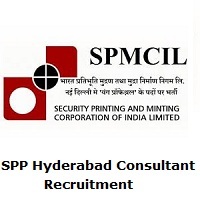 Candidates who want to get placed in the Security Printing Press Hyderabad organization, they should apply for SPP Hyderabad Consultant Recruitment 2019. Through this article, candidates can check Eligibility Criteria, Selection Process, Salary, Age Limit, Application Fee and Application Process details from this article. Aspirants who have the specific eligibility criteria, they should apply for SPP Hyderabad Consultant Jobs 2019. Otherwise, the officials will reject the application forms. The Security Printing Press Hyderabad officials are planning to conduct the SPP Hyderabad Consultant Interview on 10th April 2019. Candidates who got selected in the recruitment process, they will get the best salary package from the organization. experience in the gamut of HR/Establishment/ Purchase/Finance functions Like Manpower Planning, personnel appraisal, Compensation Management, Training & Development, Employees relationships, Personnel Services, Administrations and Employees related legal matters, Employees related Service Conditions. RTI and related matters. Scrutiny and Processing & settlement of claims/Bills, GST Compliances, Tender Processing and revaluation, Processing of Medical Claims/Bills, Processing of EPF/GPF bills, etc. Consultant (Control): Central Government/SPMCIL/PSUs retired employees having experience of post-printing operations such as quality examination, inspection counting bundling, sealing, packing and Material Handling, etc. Consultant (Printing): Central Government/ SPMCIL/ PSUs retired employees having experience in web offset machine, post-printing machine, i.e. auto printing machines, paper cutting machine, and perforating machines, etc. Consultant (Engineering): Central Government/ SPMCIL/ PSUs retired employees who worked in Mechanical/Electrical and Maintenance departments and having experience in handling breakdown works on production machines, Periodical Maintenance operations, operating and general maintenance of compressors and vacuum pump, etc. The Security Printing Press Hyderabad officials will conduct the Interview for all the applicants on 10th April 2019. Candidates age limit should not exceed 65 years. Check official notification for more details about relaxation. Candidates who want to apply for SPP Hyderabad Consultant Recruitment 2019, they must submit the application form through Offline before 8th April 2019. Security Printing Press Hyderabad main page will open. Find SPP Hyderabad Consultant Recruitment 2019 Notification in the recruitment section. Read all available data on the notification. If you are eligible, then apply for SPP Hyderabad Consultant Jobs 2019. Download the Application form and fill all important details. After that cross check all given data and submit the application form before the end to the below given address. Through this article, we had provided all valuable information about SPP Hyderabad Consultant Recruitment 2019 Notification. For more updates about all government, job recruitments keep following Sarkari Recruitment on a daily basis. Thank you.